The Vietnam Veterans Commemorative Trail stretches from the southwest to the northwest of Price County, marking significant events that occurred during the war's 13-year-time period at 13 different stations. Events highlighted were chosen by Vietnam Veterans. This scenic drive is a commemorative project to remind the public of the sacrifices made by Vietnam Veterans, an unheralded group of soldiers. The trail is located in Price County with 13 markers at various parks & monuments to represent the 13 years of service and sacrifice of the brothers and sisters in arms for each year of the war. The markers denote events of the war that were deemed important by Vietnam Veterans. Price County is a Vietnam War Commemorative Partner. The Commemorative Partner Program is designed for federal, state and local communities, veterans' organizations and other nongovernmental organizations to assist a grateful nation in thanking and honoring our Vietnam Veterans and their families. 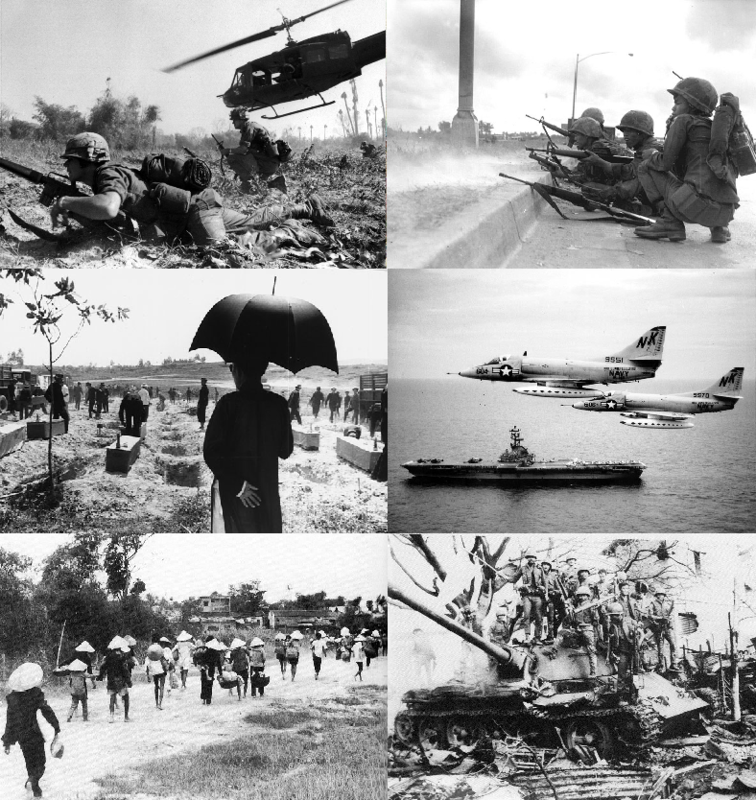 Commemorative Partners are encouraged to participate in the Commemoration of the Vietnam War by planning and conducting events or activities that will recognize Vietnam Veterans and their families' service, valor, and sacrifice. Commemorative Partners must commit to conducting two events or activities each year for a three-year period. Events or activities should be dignified, memorable occasions that show a sensitivity and appreciation for the solemnity of war and the losses suffered by many. Events or activities should meet one or more of the Congressionally-mandated objectives of the program, and as a minimum, with an emphasis on objective one. Drove all around the park and found no marker. The plaque has been removed . . .
1st row, L to R: US troops fighting in 1965 Battle of Ia Drang, UH-1 Huey infantry dispatch; ARVN Rangers defending Saigon in 1968 Battle of Saigon. 2nd row, L to R: Burial of 300 victims of the 1968 Hue Massacre; Two Douglas A-4C Skyhawks enroute for strikes against North Vietnamese PT-boat bases in August 1964, as result of the Tonkin Gulf Incident. 3rd row, L to R: Quang Tri residents fleeing 1972 Battle of Quang Tri during the Easter Offensive; ARVN recapture Quang Tri after 1972 Battle of Quang Tri during Easter Offensive. is located in Price County, Wisconsin. This is a wonderful page. I work for the Vietnam War Commemoration and just happen to see your request. Thank you so much for what you're doing. It really means a lot to the Vietnam Veterans as well as the Commemoration. I tip my hat to you in admiration.